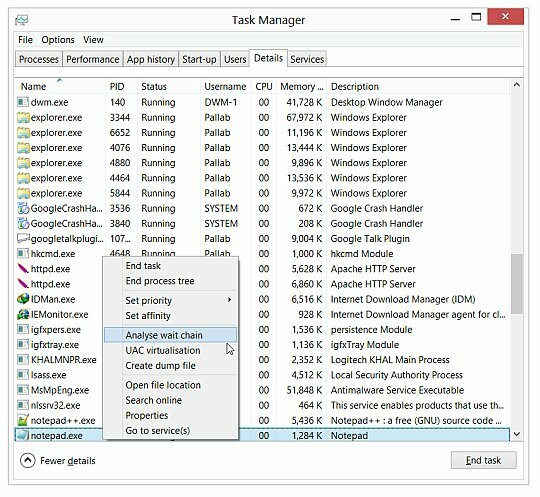 The very familiar Window Task Manager received a major overhaul in Windows 8. It has been both simplified and made more useful. The changes are beyond simple cosmetic tweaks, and there are quite a few extremely handy new options in there that are well worth exploring. I will be doing a small three-part series to highlight three little known features that can come in extremely handy. This is the first part of the series. The first feature I am going to take a look at is something called ‘Analyze wait chain’. This option is hidden in the right click context menu of the ‘Details’ tab, which is essentially a renamed Processes tab. So exactly what does this option do? Click on the “More on wait chain” link and you will be taken to this webpage, which says, “Wait Chain Traversal (WCT) enables debuggers to diagnose application hangs and deadlocks”. The rest of the webpage isn’t exactly verbose. In simple words, the ‘Analyze wait chain’ feature might come in handy when an application suddenly stops responding, and you simply can’t or don’t want to use the ‘End Task’ option. An application can switch over to the dreaded ‘Not Responding’ state due to a multitude of reasons. One of the causes is that the application is simply waiting for another process to respond. In such cases, you can use the ‘Analyze wait chain’ option and Windows will list all the processes the application is waiting for. If you are lucky, then you can simply kill the listed processes and unfreeze your application. However, note that I used the word lucky. There’s no telling exactly how the frozen application will react to you killing the dependant process. It might begin responding again, it might crash, or it might continue to remain unfrozen. 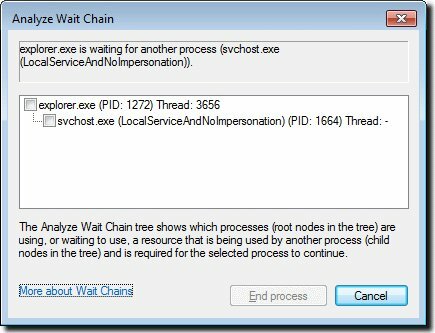 Its reccomend to use the ‘Analyze wait chain’ feature only when you believe that the application won’t begin responding on its own. If you don’t get the option to ‘End Task’ the frozen process, close the task manager and relaunch it with administrator priviledges. You can do so by searching for Task Manager in the Start screen, right clicking on the icon, and clicking on the ‘Run as administrator’ option. Before I conclude, it will be disingeious to not point out that the wait chain traversal feature isn’t exactly new to Windows. This feature was also included in Windows 7; however, it was buried in the Resource Monitor. To launch Resource Monitor, press Win+R, type in ‘resmon’ and hit enter. Yes, the new task manager in Windows 8 much more convenient to use and comes up with some new features too. I’m really impressed with the new task manager.